Prior to meeting Laura I could barely get out of bed in the morning because of my back. Since I've been working with her for over year now I can get out of bed whenever I want and actually play competitive racquetball (and I'm quite good at it!) I owe it all to Laura for helping me get in better shape and make me feel better every morning. Because of Laura's help in devising a program of muscle building and aerobic activity, in four months I increased my resting metabolic rate from about 750 Cal to 1100 Cal. Since then my husband and I have been back to see Laura for help in relieving pain in knees and hips….ah yes, she taught us about the "bolster"! I see her one hour each Tuesday and then I have plenty of "homework " to do at the gym on Thursday and Saturday with weights. I also do stretches and core exercises at home each morning. I began getting some pain relief almost immediately and could see improvement in strength by 6 weeks. Now I hardly recognize my newly toned abdomen in the mirror. Laura Coleman has been my personal trainer at Club Sport Oregon for (I think) eight years. She has seen me through good times and bad, not to mention 14 or 15 half marathons (I walk -- I do NOT run, but the distance is still 13.1 miles every time). I should also mention that I will be 61 years old this July. While there are many things to recommend getting older, it is also true that it is easier to injure oneself and it takes longer to heal as one ages. Balance, flexibility, and endurance all become issues to one degree or another. Laura has been amazing, fun, supportive, and healing as the years and physical challenges have come and gone. She has helped me get over several bouts of plantar fasciitis in just a matter of weeks, when it had taken a doctor more than 8 months to accomplish that before I met Laura. She has made me stronger with her kettlebell workouts and introduced me to rock climbing, raquetball, and any number of weight workout routines using different equipment. Laura never lets things get dull or boring. She is always ready to let you try something new. If one thing doesnʼt work for you, she wonʼt demand that you stick with it: she will teach you something that is more compatible with your needs and interests. Above all, she is focused on keeping her clients in the best condition that they can or wish to achieve -- and all with an inexhaustible sense of humor. I canʼt count the number of times we have laughed through an hour of what would have otherwise been torture. (I have often accused her of being the happiest sadist I know.) Still, at the end of every session I have always felt better, more centered physically and mentally, and ready to take on the next long, long walk. If I have any complaint about Laura, it is that she might be a little too insistent on avoiding doctors, when in fact medical attention is required. Stretching and power plate work is good and wonderful, but sometimes a shot of cortisone is called for, especially when one has dealt with significant pain for several months. That aside, I cannot recommend Laura Coleman highly enough for Personal Training, especially for those of us “of a certain age”. She is incredibly knowledgable, professional, and simply an amazing person. I had never been an athletic kid. Never did anything to onset my back problems- genetics took care of that for me. Until my back pain became distracting, I did nothing to take care of myself, but once it became more than I could ignore my mother quickly preceded to get me a few sessions with Laura. Within one appointment, my entire perspective on...well... LIFE had changed. She showed me how to read into the pain I was feeling and LISTEN to what my body was telling me, instead of just popping in a few advil. She believes in not only relieving pain, but preventing it. Now, a freshman in college, I use all the knowledge she gave me to help me as new problems arise. I found out I have a ligament condition, but as Laura instilled in me, I am listening to my body's signals and handling the obstacles with ease. I met Laura in 1998 after spending 6 months in a pool and physical therapy healing a 'stress fracture' from training for a marathon. The PT and pool time didn't change anything and a friend mentioned Laura to me. Within two weeks of working with Laura, I not only had no pain but I also dropped two bra sizes and a full pant size. Laura is a genius at looking at the basic function of the body and systematically seeing what is not working. Fourteen years later I have a book full of menus designed for function and am much stronger in many areas I previously didn't understand. She has worked with me through six marathons, ten Hood to Coast relays, two children and dozens of other changes my body has made over the years. I am a runner and met Laura through a mutual friend that is a massage therapist. I had been having hip problems and was looking for exercises that would strengthen and increase my flexibility for the purpose of continuing to run without pain. 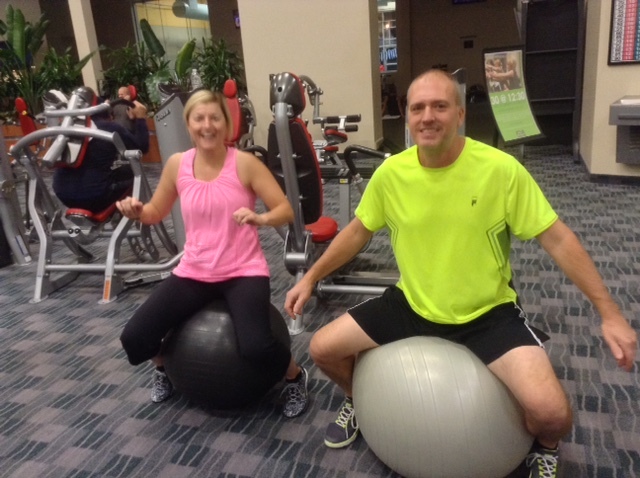 Laura introduced me to a variety of exercises that did the trick! I have continued most of them for the last 5 years or so and am still running. The exercises she showed me also increased my core strength and virtually eliminated my back problems that used to occasionally flare up. She is fun to work with and I would wholeheartedly recommend her! I have been fortunate enough to know Laura through a number of circumstances: from her volunteer work at the schools that both of our children attend, through her efforts at coaching soccer teams for those children and most crucially, for her help in overcoming an undiagnosed ACL tear. She provided me with a number of exercises that not only helped me to regain function and performance lost to the injury but also to bypass the majority of post-surgical physical therapy when the injury was ultimately repaired. Remarked the OHSU PT specialist "You certainly don't move like someone who just received a new ACL.". When I told him what I was doing he said "That sounds excellent. I'd say you're done here." (at OHSU rehab). To this day I continue to use these exercises in my workouts and have recommended Laura and her work to a number of people since. Laura has helped me with several different pain issues and always has fun and creative "regular" exercises for me to try. I feel so lucky to have met her! I first met Laura in 2002 when we joined Clubsport (a gym in Tigard, OR) and she was randomly assigned to give me two free introductory training sessions. I had injured my lower back the year before, had sciatica problems, and things just were not getting much better, even after physical therapy. I was 29 years old and was starting to decide that my back issues were just going to be an ongoing problem for me. She gave me several exercises that made my back feel better right away. It was amazing. Several of the exercises were similar to the ones I had been shown in physical therapy, but several were completely different. It was fantastic to have some techniques for making my back feel better immediately whenever it started feeling sore. I've been able to avoid any significant lower back problems since 2002. I only run into trouble when I stop doing the exercises she gave me! Several years later I started having hip pain while exercising and again she had some exercises that had me back to working out the next day. Last year I started throwing out my middle back while doing just everyday activities like easy yard work, dishes, walking across the room.....It was so frustrating and moderately painful for about 5 days each time it happened! Laura gave me some new exercises that helped me right away. I haven't thrown out my back since then. The trick is to keep doing the exercises, though! Laura's exercises really seem unusual the first time you meet with her. They all have worked so well, though, so it is hard to argue with success!! Give whatever crazy thing that she suggests a chance. She does a great job of explaining why she wants you to try something and what it will help do for you. I've also met with Laura to learn new "regular" exercises and to change my routines. She always has something new and fun to teach me. She's able to give me both exercises that I can do at home with very little equipment or new things to try with special equipment at the gym. She's given me exercises to do with a new baby and very little time, and exercises to do at my desk at work. She has a good, practical idea to help with any kind of obstacle that you can think of. Laura just has a great personality and will keep you laughing (or at least smiling!) the entire time she is giving your muscles something to do that you swear they shouldn't be doing! I can't say enough good things about her. Without her help I would probably be taking way more Advil than is good for a person. After the “graduation” from physical therapy for knee replacement, I could see I needed someone to help me take the next step to recovery - to jump start me. Someone with not only knowledge of what my body needed physically, but also with a sense of humor and a cheerful attitude, the part of the equation that makes all things possible - - - and then I met Laura, a perfect answer to all my needs. Eight years later I’m still in awe how everything fell into place and how she helped me become strong mentally and physically. When I’m in doubt, she is there with a ready answer to whatever the problem is and the cheerful spirit that makes all things possible. Due to unsurmountable anatomic back and leg medical issues, Ms. Coleman was saddled from the start with a tough assignment. She began by focusing on rehabilitating poorly and little used muscles to stabilize the pelvis, then the shoulder girdle, then addressing core musculature. From the beginning she coordinated with Massage Therapy. I had been through formal PT multiple times and only at highly reputable, prestigious medical facilities to get boring, non dynamic, underwhelming approaches that netted the expected results each time. Ms. Coleman has an amazingly high medical acumen for human anatomy and muscle physiology which is integral to a focused, high-gain, rapid outcome. She appreciates and respects complex medical issues, can think on her feet, and then rapidly deploy and implement an effective musculoskeletal strategy on the spot. I have seen this several times with particularity. Her good-natured cheerfulness speeds the sessions along and is manifestly inspirational. Her competency is only exceeded by her professionalism at all times. Ms Coleman is a highly competent businesswoman who cares to be her authentic self, and has indeed become a star. There is no single word in English to sum up her skills, so allow me to call her TIGERRRR-TERRRRFIC! Please subscribe to email updates when I have something to share with you. Thank you for inviting me into your Inbox!